KATHMANDU, June 21: National Natural Resources and Fiscal Commission (NNRFC) has set criteria for all three tiers of the governments for internal borrowing. As per the commission, the central government can borrow up to five percent of gross domestic product while the provinces and local level units can take such loans up to 10 percent of combined amounts of revenue they generate and receive via revenue-sharing with other governments. This is the first time the constitutional body has advised governments on borrowing after the implementation of full-fledged federal structure started from this fiscal year. 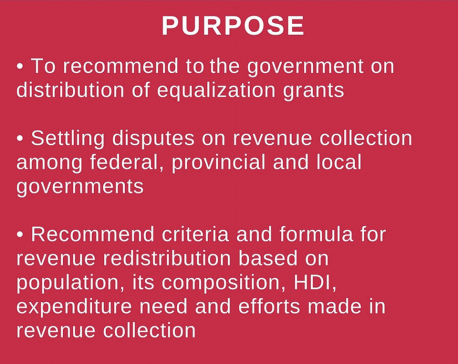 It is mandatory for both local level units and provinces to mobilize such loans on projects and programs that are directed toward capital formation and generate long-term benefits. With this, the sub-national governments are barred from spending the loan amounts in recurrent or administrative expenditure. The NNRFC has advised the federal government to use such borrowed amount for capital formation as much as possible, but the conditions are flexible for federal governments on using the loan amounts because it may also have to distribute the borrowed amount to provinces and local levels as grants, which are not direct capital spending. The NNRFC has also cautioned that borrowing without strong internal resources by the provinces may be suicidal. However sub-national governments cannot borrow immediately as the existing laws do not permit them to do so. Aryal said that they have started work on amending the laws to insert instruments for borrowing to be used by the sub-national governments. Unlike in the past years, the government started borrowing from the beginning of the current fiscal year, and has so far borrowed Rs 120 billion. It has already announced to use the entire target -- Rs 145 billion -- till the end of current fiscal year. The government’s treasury went dry at the beginning because of bulk allocation of Rs 225 billion for the local levels at the beginning of the current fiscal year, which forced the government to borrow. 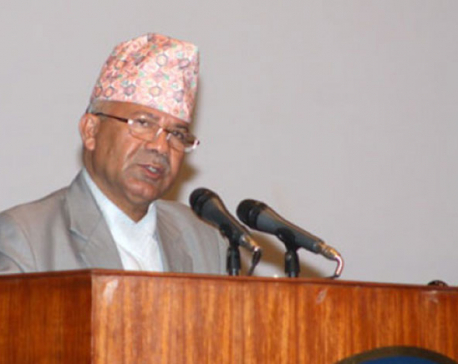 Government of Nepal has so far borrowed 842 billion in loans including Rs 454 billion, or 28 percent, in foreign loans. The Karnali Province and Province 2 have already announced to borrow Rs 1 billion each to meet shortfall of the expenditure in the budgets tabled last week in their respective parliaments. Other provinces have not specified the amounts but said they will borrow.